incredibly good shot! 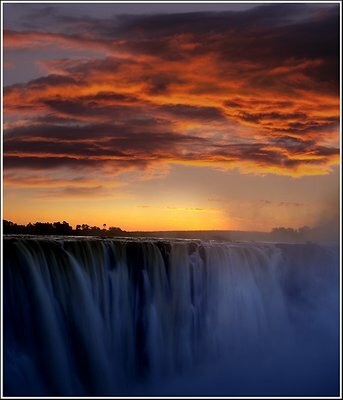 renders one speechless..
What a great wiew of those legendary falls! LOve the tones of the sky that contrast so well with the lower tones, soft, of the falls. Incredible! This is a landscape rainbow! This is simply amazing. Your time you picked to take this photo was perfict. I just had to buy one of your books to help my compositions. Yours are always stunning & captivating. Breathtaking!... How long have you been doing this! This is just amazing. I ca't find the words to describe it. Michael, this one has brought together Heaven and Hell... the more I look the more I feel attracted by it... can't really define my feelings... all I can say is that it goes straight to my faves. Wow Michael, fantastic shot. The exposure is spot on. Just perfect, a masterpiece! Loved the orange sky contrasting with the cold blue water! My best regards! Oh, good heavens! (and I mean that literally). This is a divine photograph! Congratulations on being there for 'THE' moment! Great shot! You captured a beautiful sunset and a powerful water all in the same shot.